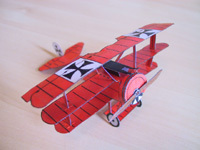 This is the red painted aircraft of Manfred, Freiherr von Richthofen (Red Baron). See also the biplane . Click to download the file triplano2003.pdf (223 Kb). You will need Acrobat Reader to open this PDF file.